Chef Rene Lenger has cooked in some pretty glamorous places. He's worked in Vienna, New York, Houston and Palm Beach Gardens. All roads, however, led to Las Vegas, where Chef Lenger is executive chef of The Country Club at Wynn Las Vegas.TravelsinTaste.com had the golden opportunity recently to chat with Chef Lenger to discuss a wide variety of topics - everything from football to filet mignon. Here's the scoop. Having worked and eaten in restaurants across the globe, one might wonder, "Why Vegas?" Well, his relationship with David Walzog, executive chef of SW Steakhouse at Wynn Las Vegas, played a big role in his decision. He'd worked alongside Chef Walzog for 10 years in New York in several restaurants. Chef Walzog had moved to Las Vegas, and one year after relocating the Country Club was hiring a new chef, and Chef Walzog wanted Chef Lenger to be it, so he called him with an invitation to visit the Strip. Prior to moving there, the last time Chef Lenger was in Vegas was 1997, when the Strip was virtually empty. "[David] said, 'We'll fly you out and you can see.' He did and I met everybody, including Andrew Pascal and Steve Wynn. They really sold me on the whole entire philosophy of the culinary aspect of the hotel. I was really, really amazed at how Las Vegas has changed from when I was here last, and what it is now culinary-wise, and by what Wynn had to offer to the chefs to be successful. There is nothing we can't get here. For example, we can fly in fish from Italy. This was what blew me away." After seeing what modern-day Vegas had to offer him, Chef Lenger acknowledged that the time was right for change. "I was in a great company for seven years and had great success," he says. "It was the right time for me to move on and focus on one restaurant instead of seven. The working long hours doesn't matter, but I had to travel and I had to sit on a plane every other day. 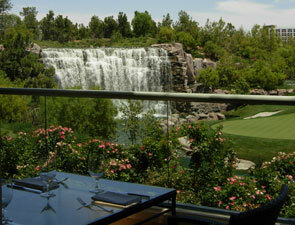 The culinary program at the Wynn was really fantastic; this is what sold me on moving to Vegas." Because he's worked in so many cities, Chef Lenger is able to contrast the Vegas dining scene with others, and he insists that Sin City's is especially unique. "It's special," he says. "First of all, we operate a restaurant at the Wynn, which is the best resort in Vegas."